6″ x 9″, softcover, 280 pages, Island Press. 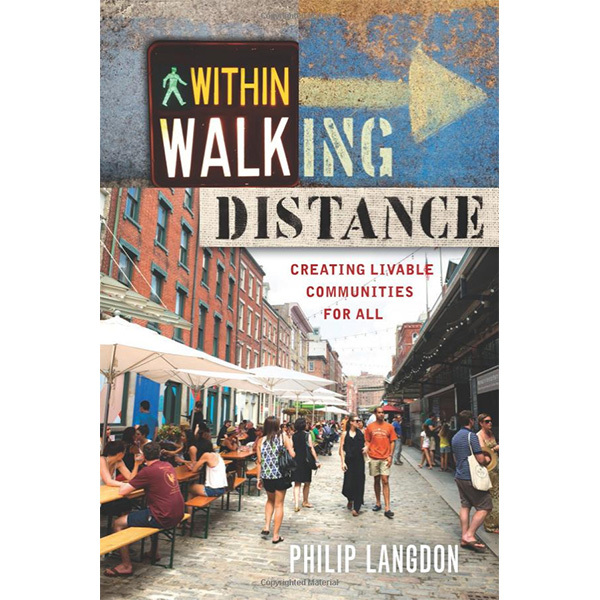 In Within Walking Distance, journalist and urban critic Philip Langdon takes an in-depth look at six walkable communities — and the citizens, public officials, and planners who are making them satisfying places to live. By considering many factors that affect walkability including safe comfortable streets; sociable sidewalks; how buildings connect to the public realm; bicycling; public transportation; housing; and the natural environment, Langdon provides a holistic view of walkable places in a very readable format. The six communities vary by size, history, wealth, education, and more. They are: Center City Philadelphia; the East Rock section of New Haven, CT; Brattleboro, VT; the Little Village section of Chicago; the Pearl District in Portland, OR; and the Cotton District in Starkville, MS. From these places, Langdon draws lessons that can be applied to a wide range of communities. Philip Langdon was the editor for the New Urban News and a freelance journalist. His articles have been published widely including in Planning, Urban Land, Planning Commissioners Journal, Preservation, Governing, Progressive Architecture, Architectural Record, Landscape Architecture, CityLab, and the New York Times. Within Walking Distance is guaranteed. If you are not 100% satisfied, you may return it within 30 days for a full refund.